Attending law school can be a different experience for students at different life stages. Younger students who matriculate directly after receiving an undergraduate degree likely have different priorities and life experiences than older students who return to higher education after spending time in the workforce. We were interested in the academic and intellectual experiences of full-time 1L law students in the U.S. We also wanted to know how they spend their time outside the classroom. Our hope is that LSSSE data can help law schools understand the unique experiences and needs of different student populations based on age. The academic experiences of younger and older students are quite different. Younger 1L students (age 27 or below) contribute less often to classroom discussions than their older peers. However, younger students are more likely to engage in email communication with faculty members and to talk about career plans with faculty or an advisor. Older 1L students (over age 35) were less likely to engage with students and faculty members outside of class. Older students were also generally less likely to have serious conversations with classmates who are different from them. However, most 1L students appear to invest heavily in their coursework regardless of age: almost three-quarters of students report frequently preparing multiple drafts of a paper before turning it in. 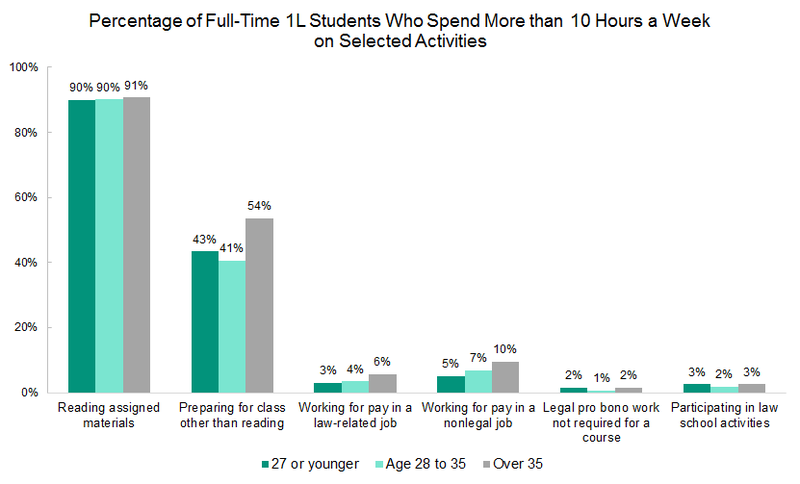 LSSSE also asks students to estimate how many hours they spend each week on various activities such as preparing for class, participating in law school activities, working for pay, socializing, and commuting to class. Different life circumstances necessitate different allocations of time and energy, and we see evidence of this among 1L students of different ages. 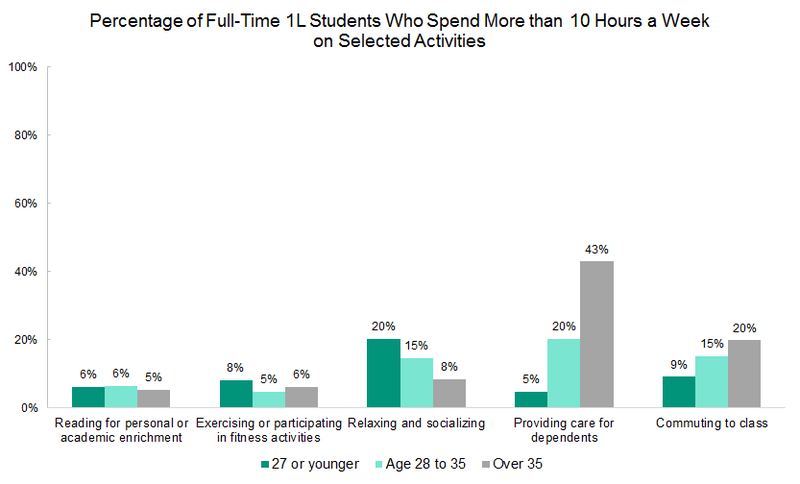 We calculated the percentage of full-time 1L students in each age category (27 or younger, age 28-35, and over 35) who spend ten or more hours per week on each activity. Nearly all students (90%) spent more than 10 hours per week reading assigned materials, and a sizeable proportion spent more than 10 hours per week doing additional class preparation other than reading. This is particularly true for the oldest category of students. The youngest students spent more time relaxing and socializing than their older peers, although this disparity is likely accounted for by the extra time that older students spent working and providing care for dependents. The oldest group of students were also significantly more likely to have spent more than 10 hours per week commuting compared to the youngest students (20% vs. 9%), perhaps because their additional outside responsibilities made relocating closer to their law school less feasible. Finally, although the majority of full-time 1L law students spent some time participating in law school-sponsored activities each week (65%), most spent between one and five hours per week. Only a tiny fraction of each age group devoted more than ten hours per week to these endeavors.